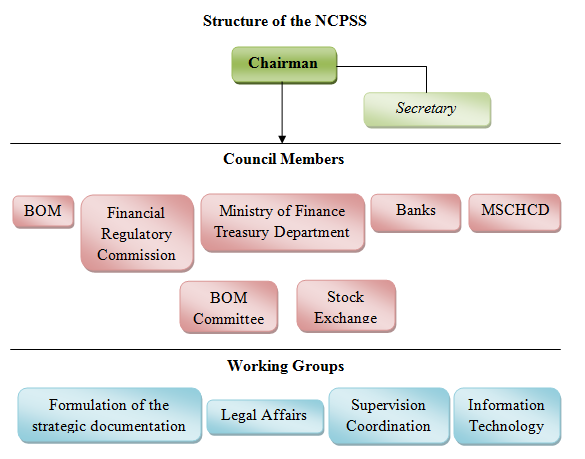 Founded on April 25 of 2008, the National Council of Payment and Settlement System /NCPSS/ works under the aims of supporting the secure and stability of financial system through the sophisticated National Payment and Settlement System and formulating the development strategic policy. In 2009, the NCPSS approved the ‘Development Strategy of the Payment and Settlement System of Mongolia in 2009-2014’ to speed up the money circulation and to continuously and reliably execute the whole payment and settlement in economic and financial market. Furthermore, the strategy aims to enhance the effective and dependable structure of cash assets exchange between the participant sides of the payment system; as well as to deliver the banking service to the people in distant areas by using the technologic advancements for the decrease in use of cash money and for the increase in spread of non-cash payment system. The NCPSS has less than 2 meetings per year and the members have voting rights. The NCPSS decisions are presented to the BOM Governor and the Board of Directors. The council works under the directions of developing the National Payment and Settlement System and decreasing the risks. Also the council establishes the working groups to analyze the system - policy related issues and to make decisions.